We already know that maxi dresses are very comfortable, vaporous and always present in any fashion addict closet. There are a variety of maxi dresses in the market, you just need to to find the right accessories and the perfect combinations. Accessories, prints, colors and a suitable pair of shoes make the difference between a maxi dress for beach and one for a special evening for example. – If you’re tall wear maxi dresses with sandals without heels, gladiator sandals if possible. You’ll look like a goddess. 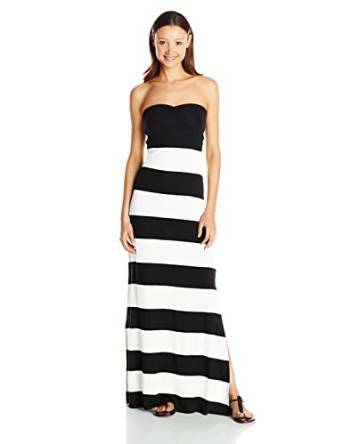 – If you’re shorter V-neck maxi dresses will be perfect for you and it would be better if you would avoid dresses with horizontal stripes. – Match the dress with a wide belt at the waist, it always helps. – Do not wear a big bag, choose a clutch, they are much elegant and stylish. For a day at the beach you can accessorize the maxi dress with a pair of large sunglasses, a hat or a scarf and a straw basket. Fill out this outfit with a pair of beach slippers or sandals gladiator type and you are ready to make headlines on the beach. In the evening wear a maxi dress with glamorous and bulky accessories. The bag can be small, in which it fits just perfect your phone, your wallet and maybe your lip-gloss. Heeled platform sandals are required to have an attractive outfit. Or maybe some high heels shoes. You can turn maxi dress in an office attire using large jewelry, gold / silver. If it is a colored dresses you must merge it with a a bag. You can wear sandals with platforms, if you like, they are very comfortable and quite elegant also. Of course this depend on your company’s dress code.